National—Says Comey had just requested additional funds for Russia investigation. Speaks of DeVos, says she is only in very secure settings, cannot answer question she hasn’t heard in advance. DeVos said if we started from scratch we would treat all methods, even untested, as viable options. Says we should not continue to support a system that has completely failed. Says he loves NY compared to what’s happening in other states. Says next shutdown of federal government will be next Sept., must be loud and proud at all times. Says other states are having success with it despite long odds. Facing people who hate us funding everything, AZ, NM have all sorts of privatization. Texas fighting vouchers but dues deduction may be illegal. Kansas is disaster, though their supreme court declared their funding illegal and insufficient. Rolled back tax cuts to pay but governor vetoed. However they say public school proud is working somehow. Things not good, massive budget deficits around country, big issue in Illinois where they have trouble funding pensions. We have to fight Constitutional Convention. Plays video of bald piano guy singing about public school teacher v. US Ed. Secretary requirements. Says now national report doesn’t seem so bad. Paul Ryan visited Moskowitz Academy yesterday. Says Eva still trying to act like Democrat who cares about city kids. Great Regents meeting. Preliminary regs came out. Says we had to explain to ed. Dept. It was 80% test scores. We have board that understands this stuff and now we are looking at multiple measure system, where we look at growth. Still more work to do, but ESSA regs more reflective of our values. Someone named Ian with NY Education Trust very upset. When Ian yells, we’re happy. ESSA regs good because whatever happens nationally those regs will ID schools who are struggling. We always have best growth in NYC. Remember I said this to you. We have preliminary new regs for CTE. Should make it much easier to get programs certified. We still have to work on preliminary new standards. Three areas they have not tackled. special ed, ELLs, early childhood. Says teachers have had a lot of input in standards. We still have work to do. Governor Cuomo had very good week. Signed education bill in NYC public school, in LIC. He thanked city teachers and union. Says union has always stood for public ed., that he couldn’t be a teacher because job was too hard, but we know other reasons. Big deal he wanted to do it in NYC public school. Two days later signed bill that NY State union dues are tax deductible. Getting parking permits back. Not because de Blasio wants your vote, but rather result of arbitration. We still have work at city council because we need to create more spots. Some admin has not been collaborative. Now if you get there first, take their spot. Principal can’t show up at 11 and get a spot. Mayoral control heating up, told mayor and everyone we don’t believe in your form of mayoral control. Senate GOP wants to tie this to charter cap. We say do neither. Conciliation—Had a joint training, have joint conciliators, have had soft rollout for process, Article 24. Want to do a few before end of school year. Sure that principals will thoroughly enjoy explaining rationale to outsiders. Informed city we will picket superintendent offices. If supe has a number of cases in district they are not working in best interests. Supporting a principal who needs to show he or she is in charge is not the way to go. Clear that after chancellor says she wants collaboration and they don’t do it, we will make noise. Spring conference Saturday. Rev. Barber will receive Dewey Award. Has defended teachers and public ed. Has done so all over country. Last night was Women in Need fundraiser. Always hear horror stories but over 70% of homeless are women with children. Difficult working with city agencies, says we’ve been supplying tutoring, GED, and help. We helped with prom dresses for 600 kids from homeless shelters. Sending to each borough, will do here and for middle schools. Next week’s paycheck will have 4.5% raise. October will be 12.5% lump sum. Says no one gave us a penny. We earned every penny, fought for it and it’s ours. National Educators and Health Care Workers week. All news about it gone because of Comey. Says we do a great job, it is not simple what goes on inside a school. No one truly understands what it takes except those who do it. Cannot thank us enough. April 28, HS awards, thanks Janella Hinds, May 6 5K run, Secretaries luncheon, Parent conference same day May 6. Coming up Sat. Spring Conference, in Bronx immigration clinic, Monday Immigration Forum here. Prom boutique May 25, over 3K dresses, suits. Wishes happy mother’s day. When is Betsy DeVos visiting a school? Mulgrew says he invited her, will talk to anyone. Says sooner or later we will get her into NYC public school. Met with student and teacher from school in Ohio she went to. Said very little. So they shipped her to Utah and gave her a prepared speech. Her family invested millions in online ed. and she says we need to invest in it. We can bring her in, show her, take pictures with her near a child. What would she do with 40% living in homeless shelter. I consider myself a mild mannered easy going person. People say I’m direct. Could you imagine if we take her to Riker’s? How’s your choice now, Betsy? Delegate—On March 22 we passed res on grading in home schools. Where are we? They were already set for this year. Takes five months for DOE to get anything right. We want this change. Waste of time and money. Members say they like it. Have to continue to work on it. Would be so much easier to follow state model. Believe there will be better treatment at sites as result of res. CL—Updates on child care or SESIS money? “Getting the runs” from city now on SESIS. We shouldn’t work on SESIS at home but it’s sometimes impossible. Workload impossible for members. Some now do other work at home and SESIS in school. We want everyone to get compensation. Tough question. Talked to Office of Labor Relations, says they’re stalling on maternity leave. Says he will go public they want to make money on people having kids. Mayor spoke two years ago and not single union has benefit. Says he knows mayor wants it. CL—Minutes say number of certified delegates—why don’t we get percentage of delegates attending? We can change it. Next month we will have number. CL—City has surplus—can we get lump sum payments early? Issue is our lump sum is so large, other unions were much smaller, city made them pay to get it on time. Some unions gave up Welfare Fund payments. Sorry, can’t be early. Delegate—Proposes that we defend anti-racist, anti sexist, anti xenophobic and other activism. Wants it to be part of Public School Proud campaign. Speaks of history of communism and teacher unions, how capitalism needs racism and segregation like we need air. Says saying we’re proud without saying we’re not proud of segregation is problematic. Sterling Roberson—Speaks against. Highlighted particular school, we engage school community. Our CBE doesn’t say attorney reps at OSI. Issue is free speech and political speech, fine line, but this res does not speak to that issue. We have issues with chancellor’s regs, not new. We have history of anti racism, xenophobia, policing in schools. Urges vote against. Point of info—What is special disciplinary case? Only principal charged, not UFT member. My answer would be speculation. Say she’s active communist recruiting children. She denies. No such categorization for us. Mulgrew—Issue of how OSI is being used is something UFT will pay close attention to. Like what DC does.OSI under direct control of chancellor. Have to gather facts before accusation. Janella Hinds—Janus resolution—Standard has been people repped by union pay. Last year was Friedrichs. Wanted to carve away agency fee pay. Abood 40 years ago said folks covered had to pay fair share. We want to insure our members understand we don’t take membership lightly, but unions need to be able to do jobs. Asks for support. LeRoy Barr—Rises to amend amendment. Says instead of stay union, we stay public school proud. Says we should strike combatting abusive principals. Says continue the campaign instead of initiate, strike the pledge. Says Public School Proud is our campaign and everything should be channeled through it. Says it involves Constitutional Convention also. Says we already mobilize members to combat abusive administrators. Says this is about Janus. Says we muddy waters by throwing everything in. Says we will go to supe and raise heck. Says CC is first. Mulgrew asks whether Janus is Public School Proud or Union Loud and Proud. Hinds—Important for us to go back for sake of other unions. Barr—Says it’s Union Loud and Proud, not Public School Proud. Stuart Kaplan—says some stuff about Public School Proud. Delegate—Opposes amendment to amendment. Says it’s good if we don’t complicate issues, important how we are going to organize. Not complicated, but simple. Union loud and proud is cross-union. We want to mobilize members more. This is what it’s about. 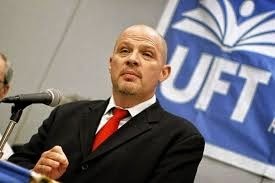 Problem because there aren’t enough UFT officials to go to every school, but it says UFT members. Everyone in union should be organizer. Barr’s amendment passes, and that will be amendment. Vote on resolution as amended. Passes. Mulgrew says second amendment is voted on and passed. Move to extend for endorsement resolution. Passes. Paul Egan—We have many endorsements. Agenda item number two all incumbents, all endorsed. Mulgrew—interviewed in borough offices, recommended. James Vasquez—Townsend Harris CL wants to speak. Reads statement about Jahoda. Describes abusive behavior. Thanks Queens UFT for support. Thanks VPs. Says there is no foolproof formula, but important all stakeholders participate. Pays tribute to fellow teachers. Says we need to stay together. Thanks leadership. Invites Mulgrew to visit. Mulgrew gives credit for keeping staff together, says he will visit.